Quick Deals Group Order Coupons Sign Up For Deals! "Everything" Topping Option: Lettuce, tomato, mayo, onion, and hots. Served with salad and cocktail & tartar sauces. Served with lettuce, tomato, mayo, bacon, and french fries. Choice of white or wheat bread. Served with lettuce, tomato, mayo, and raw onion. Served with tzatziki sauce, lettuce, tomato, and raw onion. Regular or boneless. Served with your choice of blue cheese or ranch. 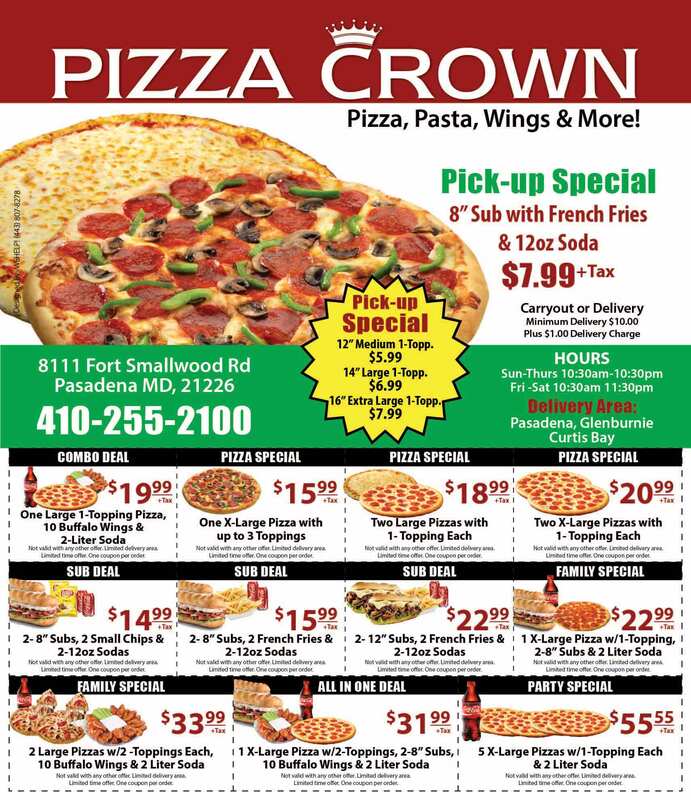 Come to Pizza Crown in Pasadena, Maryland for tasty, delicious pizza! Our menu also features Stromboli, Calzones, Wings, and more! Try one of our seafood platters such as the Shrimp Basket, Fish Platter, or Fried Scallops. Find us on Fort Smallwood Road near Fernhill Road. We're not too far from Baltimore/Washington International Thurgood Marshall Airport! Order online for carryout or delivery!